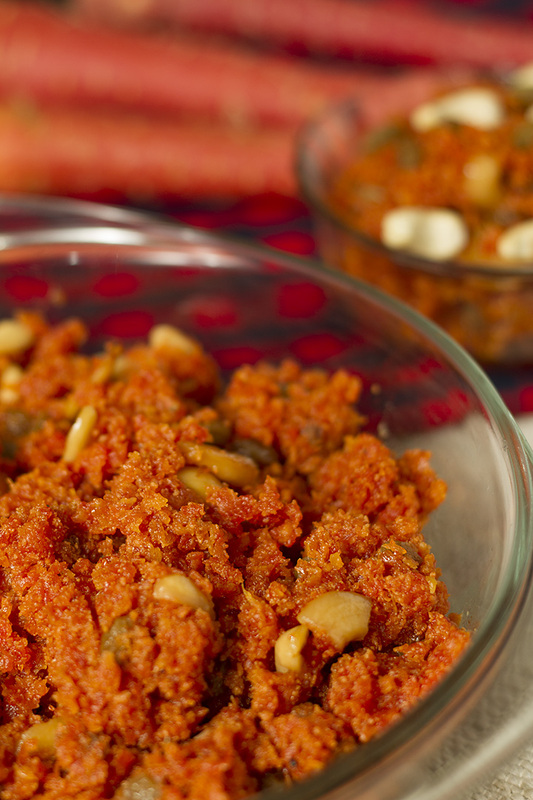 The Gajar Ka Halwa that I make takes a lot of time but tastes different. I follow a traditional recipe, however I do not use Khoya (readymade sweet milk solids) instead I boil the carrots in milk and let the water from milk and carrots evaporate before adding more ghee for frying. Sugar 1/2 cup (125 gms) More if you like it sweeter. In a large pan, mix the carrots and milk and put it on the stove. Keep stirring the mixture so that the carrots cook in the milk, the milk solids do not stick to the bottom of the pan. Keep it on the stove till all the water gets evaporated and you get a solid mixture of carrots and milk solids. Add most of the Ghee and fry the Gajar mixture till the sugar caramelises a little and the Gajar gets fried. See to it that you don't burn it at this stage. Add Cardamom powder. Shallow fry the raisins and cashew nuts in some ghee, and add them to the Halwa and your Gajar Ka Halwa is ready to be served.